[Wethersfield] (March 5, 2018) – K9CS, Inc. (K-9 Crime Stoppers) of Connecticut announced it has been awarded a $3,500 grant investment from the Petco Foundation to support its Puppies to Police Dogs program. To date, the Petco Foundation has contributed over $16,000 for K9CS to continue the donation of K-9s, equipment, officer and canine training and consultation. 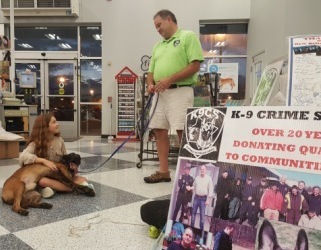 K9CS is a nonprofit organization to raise, train and donate quality K-9s to communities in need, and to support the importance of well-trained K-9 teams locally and across the country. Since 1997 K-9 Crime Stoppers has donated over a half a million dollars worth of quality K-9’s, training, and consulting across the U.S.A. This grant was made possible through the Petco Foundation’s annual Helping Heroes fundraising campaign, in partnership with Natural Balance Pet Foods. Each October during the campaign, Petco customers are invited to donate online and in Petco stores across the country to support the life-changing work of service, therapy and working animals. The Petco Foundation investment will help to support more dogs that will be donated to Police Departments and Search and Rescue teams that struggle with small or no budget for their K9 Unit. In times of chaos across the globe there is an even greater need for the donation of dogs that have detection, protection and obedience foundation training while puppies. For all K9 units there is a greater need for K9CS to provide real-life training scenarios and recognize and modify behavioral issues that arise due to trauma or the introduction of new challenges. K-9 Crime Stoppers donate the dogs, the resources and the continuing education to the Hartford Capitol Region K9 teams and to K9 units nationally. For more information about K9CS, Inc. or the Petco Foundation, visit www.K9CrimeStoppers.com or www.petcofoundation.org. Join the conversation on Facebook, Twitter and Instagram or by using the hashtag #HelpingHeroes. About K9CS, Inc. (a/k/a K-9 CRIME STOPPERS ) is a 501(c)(3) public charity whose mission is to raise, train and donate quality K-9s to communities in need. We advise and consult Police Dog and Search & Rescue Handlers and Administrators, problem-solve canine behavioral issues, and advocate for the importance of publicly supported and knowledgeable K-9 Teams in every municipality. K9CS has donated training time and fully trained K9s locally and out to the nation’s borders for over 22 years. While we focus on techniques primarily for Police or Search and Rescue Dogs, our charity recognizes the need for animal advocacy groups and encourages partnerships that span across species. Our area of concentration is the Greater Hartford region but our donated K-9 CRIME STOPPER Puppies have demonstrated their remarkable work all over the country. They were deployed at 9/11, are used to help stop the illegal drug trades along our nation’s borders, and with the horrific actions of terrorists in the world and on our own soil, our devoted and committed dogs and instruction are increasingly in demand. This entry was posted in Uncategorized and tagged belgian malinois, k9, k9 crime stopper, k9cs, petco, petco foundation, police dog, police k9. Bookmark the permalink.